It is replaced by the Datalogic PowerScan. Even in the most harsh working environments, you can depend on the PowerScan scanner to keep on working. The PowerScan family of Handheld Laser Barcode scanners has been specifically designed "from the ground up" to meet the demands of industrial users. In this tough environment the right tool makes all the difference. 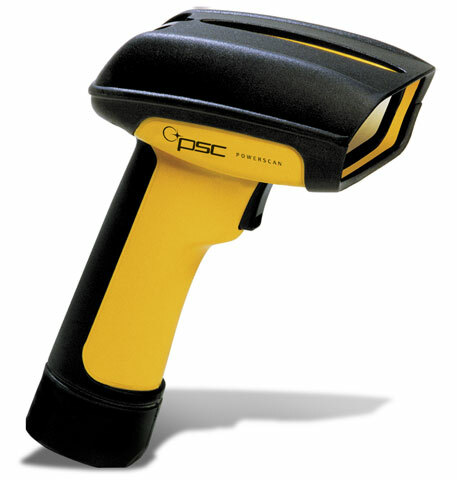 With a PSC PowerScan Scanner on the job you'll have one of the toughest most reliable tools around. You can rely on the PowerScan Scanner for fast accurate barcode reading from up close to over 65" (165cm) away. Even labels previously thought to be unreadable can now be read using PSC's new superior decoding software QuadraLogic. The Scanner will auto-discriminate all standard barcode symbologies and automatically adjust to read a wide range of code densities. The PowerScan Scanner also has a broad range of communication options using unique multiple interface modules which allow for connection to most host computer systems. Our AutoSelect feature allows you to quickly move between different hosts and applications by simply changing cables. Finally PowerScan's low current draw combined with its low power mode make it ideal for use with battery operated terminals. Specs: & 5/6 DIN PS/2 POT CABLE 11 ft.
A Tough Tool For Your Toughest Jobs PowerScan: Setting a New Standard The PowerScan family of handheld laser barcode scanners has been specifically designed "from the ground up" to meet the demands of industrial users. In this tough environment, the right tool makes all the difference. With a PSC PowerScan on the job, you'll have one of the toughest, most reliable tools around. You can rely on the PowerScan for fast, accurate barcode reading, from up close to over 60" / 152 cm away. Even labels previously thought to be unreadable can now be read using PSC's superior decoding software, QuadraLogicâ„¢ II. The scanner will autodiscriminate all standard barcode symbologies and automatically adjusts to read a wide range of code densities. Even in the most harsh working environments, you can depend on the PowerScan to keep on working. Designed to meet the most stringent drop specification in the industry, the scanner will withstand multiple 6.5' / 2 m drops to concrete. The PowerScan has a sealing rating of IP54 which means it can withstand intermittant rain showers and keep on working. PowerScan also operates over a wide temperature range from -22Â° F / -30Â° C to over 122Â° F / 50Â° C.
Handheld scanners often are dropped and abused, so this scanner has been designed with high impact-resistant material and incorporates protective rubber cushioning at every point of impact. The frictionless scan mechanism and all internal optical components are shock mounted to maintain precise alignment under high shock loads. The scan window is made of shatter-proof material and is diamond coated to resist scratching. Even the replaceable interface cable is protected with an integrated metal strain relief. The PowerScan has a broad range of communication options using unique multi-interface modules, which allow for connection to most host computer systems. Our AutoSelectTM feature allows you to quickly move between different hosts and applications by simply changing cables. In addition PowerScan 's low current draw, combined with its low power mode, make it ideal for use with battery operated terminals. *This RS232 interface only supports RXD and TXD, no control signals are available.